SINGAPORE (ICIS)--China’s ban on imported plastics waste could not only boost demand for virgin material significantly but also polyester feedstocks paraxylene (PX), purified terephthalate acid (PTA) and monoethylene glycol (MEG). The country’s imports of plastic scrap peaked in 2016 at about 8m tonnes, accounting for almost half of plastics waste trade globally. Polyethylene (PE) and polyethylene terephthalate (PET) accounted for more than half of the total volume at about 2.5m tonnes, Citi said in the report titled “Rethinking single-use plastics: Responding to a sea change in consumer behaviour”. The country’s imports started to fall rapidly in the second half of 2017 and have been negligible in 2018 after Beijing decreed that the economic powerhouse will no longer accept low-grade plastic waste for recycling. “This has had a positive demand impact to the primary resins market for both PET and PE due to [the] substitution effect,” Citi said. In PET, recycled materials were previously processed into polyester staple fibres, which means that the plastic waste ban in China could lead to a rise in demand for polyester condensation feedstocks. Import replacement could also boost domestic virgin resins demand significantly, as recycling PE was roughly 8% of the total market size in 2016. In 2017, China scrap PE imports dropped 23% year on year but virgin PE imports rose 18%. The substitution trend has continued into 2018, with another 1m tonnes of additional virgin PE demand expected in 2018. This accounts for 1% of global PE demand, or 4% of China demand. “This could partially offset the incremental PE supplies from the US in 2018 and improve the global supply-demand fundamental picture. However, we believe over time, the impact could gradually diminish as recycling processors relocate to other countries,” Citi said. “While the timing and implementation of specific regulatory actions by Chinese authorities is not always certain, we believe the recycled plastics ban is not going away, and in our view the dramatic impacts we’ve seen on US and European plastics producers may be just beginning,” it said. China’s ban could ultimately help catalyse companies to seek better alternatives, change consumer behaviour and give rise to more effective recycling, Morgan Stanley said in a recent report. “Short-term, the major petrochemical companies are benefiting from a reduction in plastic recycling in China with the polyester upcycle getting stronger and firmer,” said Jessica Alsford, head of Global Sustainability Research at Morgan Stanley. Even as European regulators are taking aim at plastics, Alsford added, such efforts will need to be adopted globally to have a material impact on the global petrochemical industry. Relatively low oil prices are also a factor. Oil needs to sit at or above $65/bbl for recycled product to be more economically viable than virgin plastic, according to Alsford. China’s ban has also accelerated plans for single-use plastic bans by other governments, with global chemical companies increasingly looking at ways to broaden their portfolios to include environmentally-conscious alternatives. “While we’ve seen local, regional, and some national bans on isolated plastic packaging products over the last ~20 years, environmental actions taken by the Chinese government this year have transformed and accelerated the move out of single-use plastic,” Citi said. “As China has been the dominant importer of plastic scrap with an annual plastics consumption of 8m tonnes, this has led to a collapse in the price of various recovered plastics materials, and a glut of oversupply piling up in western ports,” it said. Citi estimates that about 150m tonnes of plastic packaging waste is produced globally each year. The most common waste-generating polymers include low (LDPE) and high (HDPE) density polyethylene, polypropylene (PP) and polyethylene terephthalate (PET), according to Citi. With China no longer importing plastics waste and other countries unable to absorb the high level of supply, exporters are likely to be forced to expand on domestic recycling infrastructure and/or cut back on the level of waste being produced. Echoing China’s actions, national and local governments have launched their own plastics bans. The UK has taken the lead on preventing plastics waste with proposed bans on plastic cutlery, straws and cotton buds/swabs. The EU has followed with itsr own ban, indicating that once implemented in 2030 the changes could cost its businesses more than $3.5bn a year. Some of the most aggressive bans have been in emerging economies. 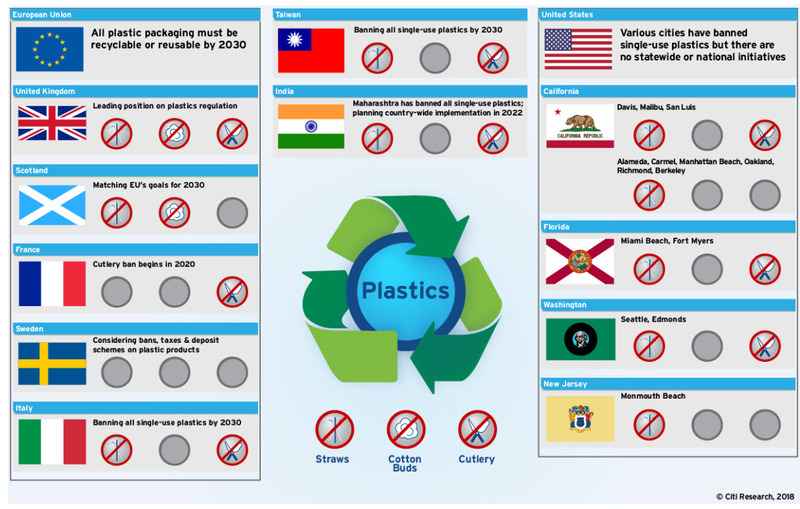 “Given these countries’ per capita plastic use is very low, the bans have the potential to sharply impact future consumption growth of plastics,” Citi said. Chemical companies are adapting and are focusing on “light-weighting” their products, investing in plastic recycling companies, improving recycling systems and creating bio-based polymers. According to Citi, almost 1m tonnes of biodegradable plastics capacity has been built, and with appropriate legislation, the economic incentives could be established to build-out these higher-cost product capacities, addressing the environmental concerns. PETRONAS president and CEO Wan Zulkiflee Wan Ariffin at the recent Asian Petrochemical Industry Association (APIC) conference in Kuala Lumpur, Malaysia, said that protection of the environment would be one of the main considerations for consumers and policy makers in hammering out energy policies. “Today’s generation of consumers are much more aware or better educated, demanding more environmentally-friendly and biodegradable products,” Wan Ariffin said. The recent ban on single-use plastics is a great “wake-up call” for the industry, said Kamal Nanavaty, president of the Chemicals & Petrochemicals Manufacturers’ Association of India (CPMA) at the same event. Environmental degradation is the greatest threat to future society, warns Nanavaty. “It is vital that all stakeholders are made aware of the real contribution that plastics make to society and the fact that it is a part of the solution to the biggest challenges facing humanity rather than being the problem,” he added.